Raspberries. They’re where sweet and tart meet to create a perfect rosy tang. These simple berries pack bright, natural flavor into our Raspberry Syrup, which turns both hot and cold drinks into decadent creations that burst with freshness. Third party certified organic by Quality Assurance International, Monin Organic Raspberry Flavored Syrup is made with organically grown pure cane sugar and the finest natural/organic flavors with no additives or preservatives. 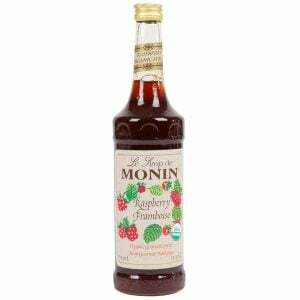 Monin Organic Raspberry Syrup helps you create amazing sodas, cocktails, lemonades, teas, lattes and mochas.